July « 2010 « Welcome to Property Source Nation! What is burnout? In brief, it is a prolonged period with less energy, less enthusiasm and less motivation. You continuously feel exhausted both physically and emotionally. You are inexplicably impatient, moody, frustrated, angry, and frightened; and/or you feel increasingly hopeless, helpless, cynical, and resentful. Procrastination and/or inactivity are common. What causes burnout in Real Estate Agents? You lose your sense of purpose. You lose your sense of why you chose Real Estate and what you want your Real Estate career to do for you. You feel that your environment is disorganized, chaotic, and full of pressure with many expectations from a variety of sources and little or no help; so you are on your own. You are not clear on how to succeed or whether you are succeeding. Your job requirements seem to be constantly changing and impossible to achieve. You are criticized, not recognized, and not rewarded for effort. You feel that you have little control over the results of your efforts. You have a stream of disappointments, particularly ones that are out of your control. You have or take little, if any down time. For many Agents this describes the daily experience of their Real Estate career. They frequently feel and fight burnout. I am often asked how to deal with it and how to prevent it. It’s the worry not the work. First is important to understand that it is not the work that causes burnout. It is the worry. It is not working seven days a week. It is worrying seven days a week. The following preventative measures reduce worry by giving you the mindset, structure, and energy to deal with burnout and permanently prevent it so that it is a thing of your past. As you go through these preventative measures be careful. Take them on one at a time. Progress equals happiness. Do the first one for a week or more before you do the second. And so on. Set a low standard. Do just a little bit of each one to start and then keep doing more until it becomes a part of your normal business and life habits. How do you prevent burnout in a Real Estate career? Personal: Start each day with a positive, relaxing ritual. Before you open your e-mail or make a call, even for a short time, walk, stretch, exercise, or just breathe deeply. Read something that inspires you; put it in your bathroom. Focus on the things you are grateful for. You can do this without leaving home. tart with as little as five minutes. Evaluate your diet, rest, and health habits. Eat three meals at mealtimes. Cut down on junk food, smoking, caffeine, alcohol, and recreational drugs. Keep yourself hydrated with water. Take walking and breathing breaks frequently during the day; when you do breathe deeply at least five times. Get to bed earlier, if possible. Business: Clearly identify and write down the answer to these two questions and read them every morning as you begin your work day. Carry them with you and read them frequently until they are second nature to you, part of your psyche. What do I want my Real Estate Career to do for my life? Why is that important to me? Reduce those answers into the following number. In the next twelve months what is a realistic amount of income or production that would be a clear indication that you are on your way to achieving what you want? It probably will not get you there in one year. Instead, it is a realistic number for the next twelve months that is a clear indication that you are making progress. (Progress equals happiness.) There is always a realistic number that is a clear indication. Your psyche may fight it. Fight back and choose that number. Know your progress. (Progress equals happiness.) Reduce your twelve month goal to monthly goals, starting this month. Be sure they are realistic. To get past burnout it is far better to exceed than to fall short. Choose a daily or weekly measure that is an honest indicator of your progress. Measuring initial appointments with new Clients per week is the best measure. Record and review those measures daily at first, then weekly. Create a simple set of daily habits that accomplish the basic necessities of your career. Schedule just 30 minutes each day at the same time, on the same day, and in the same place for each habit. E.g. Mondays at 9 a.m. prospect to make appointments; Tuesdays at 11:30 a.m. Marketing; Wednesdays at 9 a.m. Service Contacts: etc. Start with a minimum number you can handle. Take time off. If necessary, start gradually. Start with a block of two, three or four hours doing something personal; sleeping, walking, reading, gardening, exercising. It is best if this is not on your computer or on the phone unless you turn off call waiting, texting, or any other feature that will trigger the stress of work. Find someone to check your voicemail to let you know if there is a priority and extend your time blocks until you are taking whole days off on a weekly basis. Yes you can. Your burnout is no fun; for you, your Clients, your co-workers, and your loved ones. These strategies can eliminate burnout. You can have a successful business (and life) without burnout by implementing these strategies into your own business. Rich Levin is a Real Estate coach and teacher whose focus is teaching Agents to understand and control their business. Through that understanding Agents achieve satisfying, successful careers and lives. For more information on Rich’s work; go to www.BestCoachingOnEarth.com. Rich is President of Rich Levin’s Success Corps Inc. Contact him at 585-244-2700 or rich@richlevin.com. When New Castle Airport’s Tower Operations discovered fog blooms inside the lites of glass, they put out a call for a replacement immediately. Little did they know, they would end up with an environmental innovation that saved months on delivery, and tens of thousands of dollars. 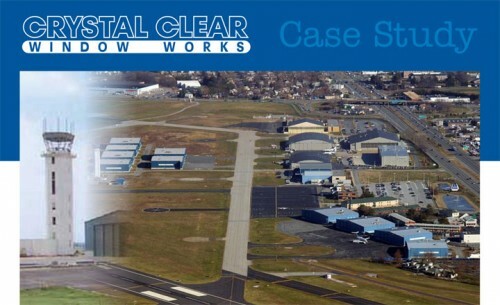 On July 28, 2007 Fog Busters of Lancaster, Pennsylvania, an authorized Crystal Clear Window Works Dealer, successfully removed moisture from a failed thermal pane unit at New Castle Regional Airport, a Class-IV-certified FAA facility. At 56 sq. 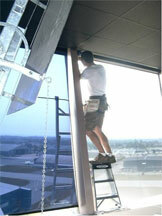 ft, and over 500 pounds, this dual pane insulating glass unit with 1/2” thick glass presented a challenge, considering it was situated atop the 112 ft. Air Traffic Control Tower (ATCT). Both the facility project manager and replacement contractor, recognized the significant costs, risks and logistics associated with replacing the unit. Installation was estimated at over $40,000…on a unit that was only seven (7) years old! Most notably, how to proceed without disruption to tower’s staff, and how to resolve the problem in a timely fashion in a place where reduced visibility has life or death implications. 1. the unit was experiencing early stage failure. 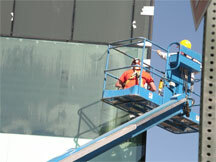 The moisture problem was restorable but would quickly deteriorate and damage glass if left untreated. 2. a southeast orientation was protected from traditional moisture sources like wind driven rain and accelerants like direct solar energy. 3. the degradation of sealant about the exterior and interior of the unit would serve as conduits for moisture. 4. manually operated ‘climate control’ and a higher than average interior humidity could negatively impact curing conditions for the unit. 5. exceptional environmental conditions including wind loads often above 25 mph, with common peak gusts of 60 mph, along with anomalies like air vibration, seasonal temperature deltas, and of course, higher than average interior humidity. Fogbusters owner Herb Ingram and Head Technician Steve Cahill recognized they would have to address potential moisture conduits located on the exterior. 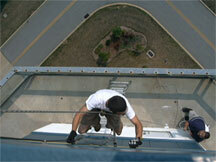 Using a combination of ladder work and daring, but secure, mountaineering techniques, Cahill applied new seals to the exterior of the unit. They calculated that the unit could cure itself by introducing a venting valve oriented toward the semicontrolled interior environment. The resident moisture would vaporize during the heating cycles of passing days, and be expelled through the vent. Once pressureequalized, the IG would no longer experience the atmospheric conditions that infuse moisture and humidity into the unit. They recognized higher than average interior humidity level could present issues, but figured that the level would not be sufficient to bring enough moisture into contact with the system. Given the volume of moisture inside the unit, and the anticipated temperature of interior glass, there would be no dew point at which condensation would develop over the curing period, so they would be able to keep the unit clear. Fogbusters chose a flexible, evolutionary application that combined sash maintenance and CCWW’s VMax authorized procedure to optimize insulating value. Cahill applied a dry-drilling technique, introducing little to no net new moisture into the unit, and chose to let the unit dry itself. Because the size of the unit could negatively impact the drying, he is prepared to enhance cross- ventilation as required with additional venting chambers to accelerate curing. This groundbreaking, environmental application on an ATCT preserved a quarter ton of perfectly good glass from going to the landfill. The restoration deflected the carbon burn of manufacturing a replacement unit and will generate energy savings of 10-15% for the unit. The service is already being evaluated as a preventive application on other FAA units to prevent future failures. Clear for Take Off New Castle! • New Castle Airport. Gary Mascelli, Project Manager (302) 571-6375. 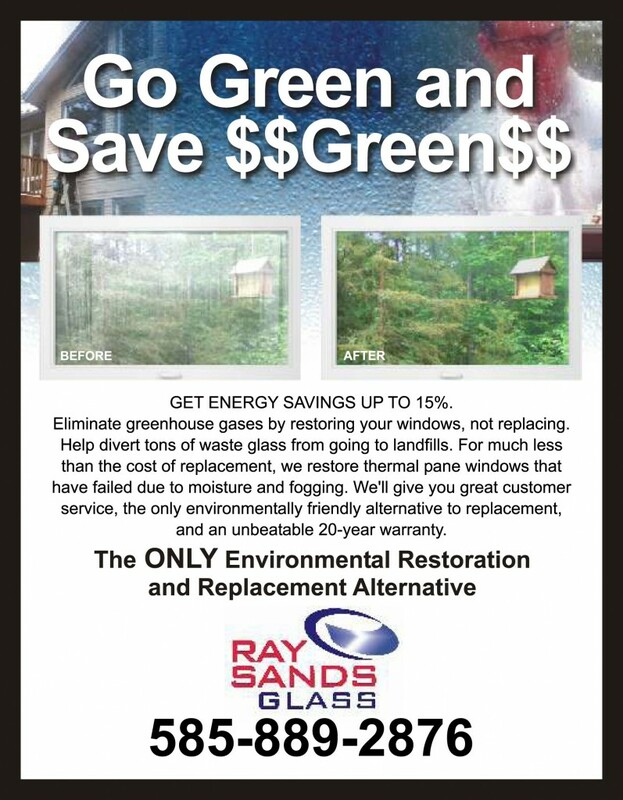 • Crystal Clear Window Works USA. 800-4-FOGOUT ext 113. When the Museum of Contemporary Art in Denver discovered moisture blurring their ultra-modern, glass marquee, they used an innovative, environmentally-friendly solution that kept an important construction deadline on track and on budget. 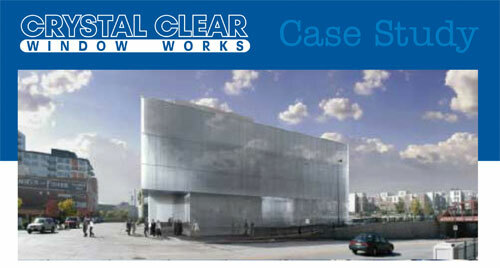 On September 28, 2007 Get the FOG Out of Denver, an authorized Crystal Clear Window Works Dealer, successfully removed moisture from a failed thermal pane unit at the world-class Museum of Contemporary Art in Denver. 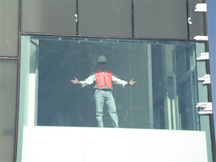 The glass contractor for the project was in front of a logistical and costly problem. Heavy equipment was scheduled to be moved offsite within days. Ordering a custom replacement unit might take weeks. The cost of this alternative would exceed $25,000. So he contacted the local Crystal Clear Window Works dealer. 1. The unit may have experienced elevated structural stresses through transport to and around the worksite, compromising seal integrity. 2. 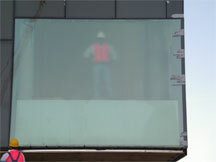 The moisture problem was restorable but would rapidly affect clarity if left untreated and bring damage to the glass. 3. Vapor pressurization estimates drawn from what they knew about the exterior atmosphere and controlled interior, pointed to a drying period of 3 weeks and in advance of the Museum opening. 4. Unit seal is fully exposed to precipitation and runoff projected 1” beyong building facade. 5. 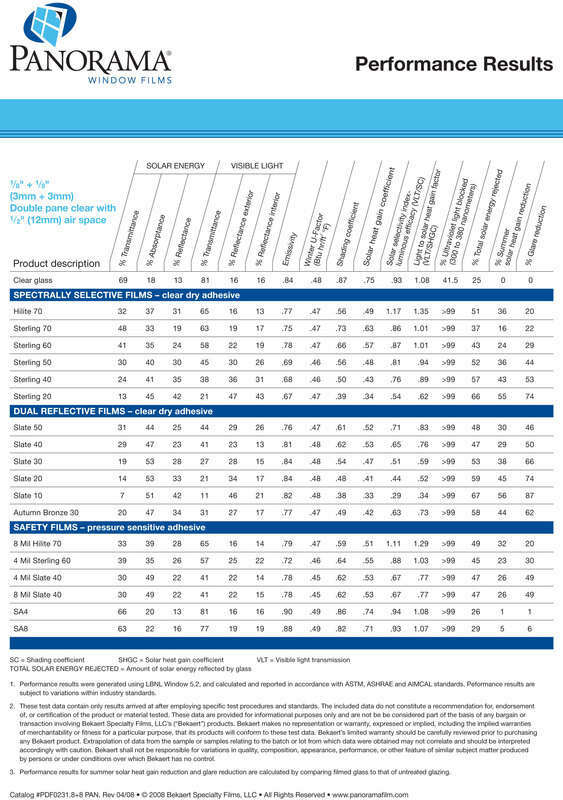 The unit does not require thermal optimization, it only needs clarity. Baker and head technician Mark Alvarado decided they could dry the unit naturally. They would apply a series of air sieves to create an air flow venting across the span of the unit to significantly accelerate curing. Baker recognized they would have to be able to keep the unit clear. Estimating the volume of moisture inside the unit and the expected rate of expulsion with limited solar exposure and early, Colorado fall temperatures, they forecast a 4 week curing period and a dew point low enough that no condensation would develop to impair visibility at launch date. GTFO used CCWW’s V2Clear authorized procedure for tempered glass. Because of the size of the unit, they are prepared to enhance cross-ventilation as required with additional venting chambers to accelerate curing, as required. The direct exposure to precipitation and the moisture conduits located along the perimeter presented their greatest challenge. The unit would be sealed with a clear marine epoxy bond to maximize moisture deflection, and ultimately capped by the contractor. Once pressure-equalized, the IG will no longer experience pressurization that infuse moisture & humidity into unit. In the end, all deadlines and expectations were more than met and all partners content, including the city of Denver that kept a 1/2 ton of glass out of its municipal waste stream! • Crystal Clear Window Works USA, Corporate Franchisor and authorized license distributor of glass restoration and window defogging technology.